Need something that you can throw together with store cupboard ingredients any time you have some unexpected guests? This is it. Serve it with drinks, as an appetizer before a meal or just as a snack while you catch up with some friends who decided on the spur of the moment to stop by for a quick hello. It takes less than five minutes to make and with a good loaf of bread it’ll satisfy even the most difficult of guests. You can add anything you like to it really, but a traditional combination would be down the Mediterranean route: oregano, basil, rosemary, red pepper flakes, garlic. Pour enough olive oil (don’t skimp on the good stuff here, it’s the main ingredient) to sumberge all the herbs and the garlic and stir to combine. The longer you let it sit, the better it is, but it’s ready to go right away. 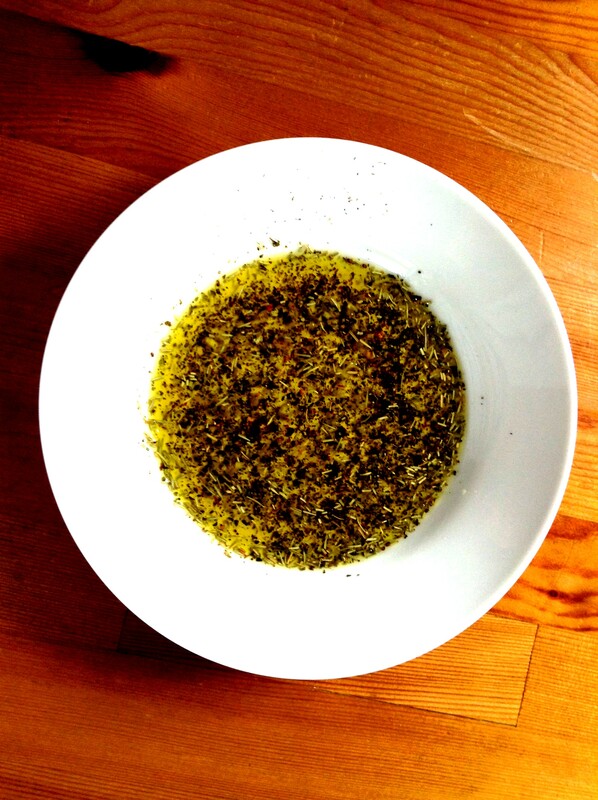 The moment you dip a warm chunk of bread into this and smell the herbs releasing their oils, you’ll be hooked. I could quite easily have this as a meal on its own. It’ll probably keep pretty well in a sealed bottle or jar, but if you want an exact shelf life, I don’t know. It’ll never last long enough to go bad anyway.